Lockport, NY - Alex and Jay Krull, of The Niagara Art Trail, work with Terry Abrams, curator of the Niagara county historical Society to install the show "ART"-chives. The Niagara County Historical Society is opening up their archives for an art exhibition titled "Art"-chives, presented by The Niagara Art Trail. The exhibit opens this Saturday, February 9 and runs through March 16. The Niagara Art Trail is pleased to present an exhibit of works from the ‘Art’-chives of the Niagara History Center. Nearly thirty pieces from artists past and present have been selected from the hundreds comprising the History Center’s collection. Some may not have been seen by the public since their acquisition. An opening reception will take place on Saturday, February 9th from 1:00 pm – 2:30 pm at the Niagara History Center 215 Niagara Street in Lockport. Light refreshments will be served at this free family friendly event. The exhibit will remain up through Saturday, March 16th. The History Center is open Monday through Saturday from 9:00 am – 5:00 PM. The idea for the exhibit came about last summer. As part of the annual ‘Art in the Halls’ exhibit at the Lockport Presbyterian Home the Niagara Art Trail featured about twenty-five pieces from the History Center’s collection along with 250 plus additional works by dozens of other artists and photographers. Including these historical paintings was meant as a precursor to this exhibit. The Niagara Art Trail plans to make this exhibit an annual event as well. Many of the artists’ names such as Raphael Beck and Ollie McConnell will be familiar to locals. However many pieces are from lesser-known artists or complete unknowns. Some works show buildings or scenes from throughout Niagara County. There is everything from a bird’s eye historic view of Falls Street in Niagara Falls, to the Somerset Lighthouse and several points in between. 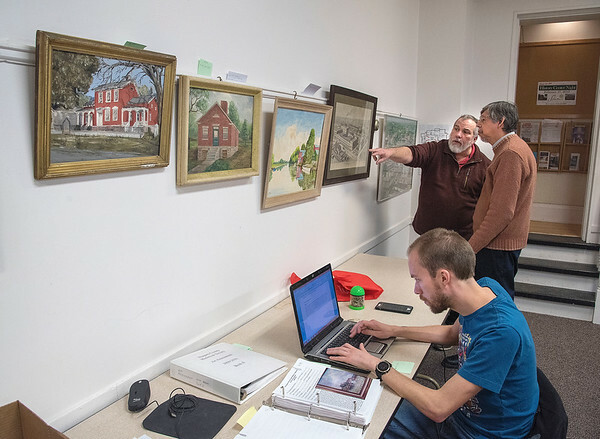 While searching through the many works Niagara Art Trail Director Jay Krull along with his son Alex and History Center Curator Terry Abrams came across a few surprises. An old photo of a child sparked some interest when it was noticed that the photo had shifted in its frame to show something different underneath. Mr. Krull is familiar enough with the work of one of Lockport’s most known artists that the small reveal was enough to recognize it as a Joseph Whalen work. It was quite an unexpected and exciting find. It is one of two Whalen pieces which will be in the show. The other is a framed poster Joe did as a retirement gift. We do not have a lot of information other than the name of the retiree and where she retired from. It has a list under the drawing showing the names of those who were honoring the recipient. We are fairly certain the calligraphy was done by someone other than Joe Whalen. The hope is that folks coming to see the exhibit can help fill in the blanks on this and other works in the show. When items are donated to the Historical Society the information can often be quite limited. Portraits make up a significant portion of the Center’s collection. Some of the subjects are identified, some are not. Some are historical figures, others are not. Just a few of these portraits are included in this show. Perhaps the most interesting among them is a work painted by a German prisoner of war, who was held at Fort Niagara during World War II. The subject of the portrait is the wife of one of the guards. This is a good example of art helping tell the story of bygone days. Most people probably give little thought to the United States having POW camps during WWII and fewer probably know that there was one right here in Niagara County. These tidbits of information open the door to more questions and hopefully further discussion, leading to more knowledge of our history. The oldest painting in the exhibit is from 1849. It is an unframed winter scene. Not much is known of the artist other than he was a prisoner in the Lockport Jail at the time. The purpose of this show has several facets beyond allowing these works to be viewed and enjoyed. Each work tells a story and maybe someone viewing it can help complete the story. On some level each painting can remind us of our rich history and even speak of eras gone by. And finally and possibly most importantly, it brings attention to the fact that much of the work is in need of some TLC if not complete restoration as well as more complete documentation, carrying on and expanding upon each one’s story. This is sure to be an interesting display and a great reason to get out if you’re feeling a bit of cabin fever. Everyone is welcome, so bring the family or some friends. Listen closely with your eyes and keep your ears open too. The person alongside you might have a chapter to add to the stories of these visual tidbits of history.